Sprint today unveiled a new simplified wireless plan offering 50% off competitors' rates -- part of an effort to lure consumers to try its faster LTE Plus network, which promises speeds of 128Mbps or more. 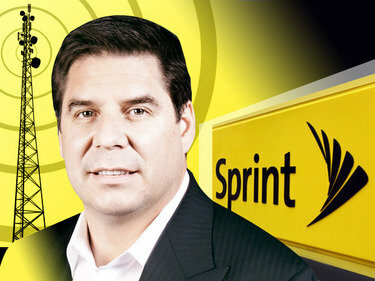 Sprint CEO Marcelo Claure said the costs of the new program will be more than offset by revenues from new customers. "There's absolutely no way anybody can beat this offer," he said during a briefing with reporters. Sprint, the nation's fourth largest carrier with about 59 million customers, has said it must cut up to $2 billion or more in operating expenses for the next fiscal year starting in April and will eliminate thousands of jobs to do so. Even against that dreary backdrop, Claure said the new rate plan will bring in more customers. He didn't indicate how many more are expected. "There's been a lot of skepticism on our network and the only way to convince them is to have them try," he said. "Rest assured, we've done sufficient analysis and this is very accretive to Sprint" profits. Sprint's newest deal allows customers to take 50% off the price of most Verizon, AT&T and T-Mobile rate plans. The only rate plan excluded is T-Mobile's unlimited data plan, which costs $90 a month. Sprint will still offer a $70-a-month unlimited data plan. Businesses are not included in the deal, a spokeswoman said. With the new plan, as an example, a single line from T-Mobile that costs $50 for 2GB of data per month will cost just $25 on Sprint. In addition, Sprint will pay up to $650 per line to switch. Also with the new offer, Sprint is offering a free 7-in. Alcatel tablet, valued at $360, with one year of free service on a two-year contract. Customers must port one line from a competing carrier to qualify; the savings can be applied to up to nine lines. The offer goes into effect for activations beginning this Friday, Nov. 20 until Jan. 7, 2016; the 50% off deal remains in effect until Jan. 8, 2018. Claure said that with a free tablet and a free year of service, along with the half-off pricing, "that's the bet we're making" to get new customers. Claure added that Sprint will be "very vocal...that the quality of the network has dramatically improved year over year." To take advantage of fast LTE Plus speeds, customers must buy a newer phone like the iPhone 6S, which supports carrier aggregation technology. LTE Plus is now in 77 U.S. cities and relies on LTE Advanced carrier aggregation, which means Sprint bonds multiple spectrum channels together to build a fatter pipe with double the capacity and speed, Sprint CTO John Saw said in a blog post. Along with the savings, Sprint is allowing customers 28 days to try the new service. If they're not satisfied, they can return a new device with no restocking fee. Analysts praised the move, noting that the risk-free trial period is better than a "Cut Your Rate Plan in Half" offer introduced a year ago. People weren't willing to switch back then in sufficient numbers because they weren't sure of the Sprint network, analysts said. "To tell the truth, this new offer sounds too good to be true," said Jeff Kagan, an independent analyst. "It's another way for Sprint to punch their way onto the map." Roger Entner, an analyst at Recon Analytics, said that Sprint needs to add enough customers with the deal to plow ahead of T-Mobile, which is in third place with about 60 million customers. Sprint fell to fourth only last summer. "Sprint is making an aggressive new offer and has made progress with its network," Entner said. "They want people to try it. In fact, Sprint is trying everything they can to get subscribers, which is the one metric that really leads to profitability. Catching T-Mobile is what they are aiming at, and T-Mobile has added 1 million-plus subscribers every quarter for more than two years now."